The two-part series on “Arsenic Challenges for Water Utilities” has provided useful information for the many small water utilities faced with arsenic problems. Part II states that treatment options fall into six major categories and then proceeds to provide a short summary on each technology and selection considerations. Unfortunately, Part II fails to mention one very important group of arsenic treatment options: the iron and manganese removal processes. These processes, which include oxidation/filtration and manganese greensand, are very effective treatment processes for arsenic removal and have been listed by the US Environmental Protection Agency as best available technology when the Fe:As ratio of the water is greater than 20:1. USEPA has reported that approximately 500 water supplies in the Midwest alone have arsenic levels exceeding the arsenic MCL, an area of the country where arsenic frequently co-occurs with high iron and manganese. Many of these water supplies have iron and manganese levels above the secondary maximum contaminant levels (SMCL) and, thus, either have iron and manganese treatment processes in place or control their problems with sequestering chemicals. Several of the treatment options discussed in Part II [of the Opflow article] utilize the adsorption capability of iron for arsenic through the application of either an iron coagulant or an iron-based adsorption media. As expected, therefore, natural iron also has the ability to adsorb arsenic by similar mechanisms. Thus, by removing the natural iron from the source water, a utility can usually remove a significant amount of arsenic. Consequently, the very first step for any utility faced with an arsenic problem should be to examine the Fe:As ratio of its source water. The Fe:As ratio of 20:1converts to 50 ug/L As per 1 mg/L of Fe, which means under optimum conditions for every 1 mg of iron removed, 50 ug/L can be removed. Considering the above information, I would propose a simple, supplemental guide (below) to the treatment information provided in Part II. The figure was developed with the recognition that water systems can and should take advantage of the arsenic adsorption ability of natural iron. The figure is divided into three zones, A, B, and C, determined by the Fe:As ratio of the source water and the iron SMCL of 0.3 mg/L. In Zones A and B, the iron level is above the SMCL, which means iron removal or control should be applied to the water supply. 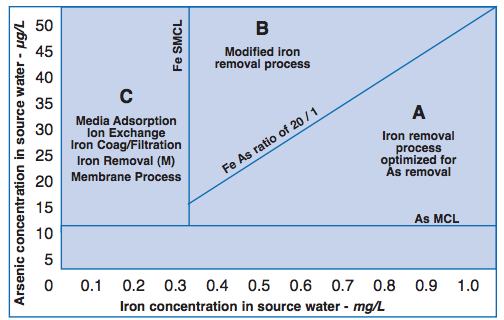 In Zone A, the Fe:As ratio is > 20:1, and, therefore, any iron removal process optimized for As removal should be able to achieve the arsenic MCL. In Zone B, the Fe:As ratio is < 20:1, which means an inadequate amount of iron exists in the source water for achieving the As MCL. However, process modifications, such as adding some additional iron, can still enable an iron removal process to achieve the As MCL. In Zone C, where iron level is less than the SMCL, the technologies discussed in Part II should then be considered to determine the most appropriate one.